Chiron, the planet of healing, awareness and growth, is in rare form. Have you heard of Chiron? If not, you might look into it. Chiron is a modern planet (the first of the centaur planets, discovered in 1977) that reveals more about your sign since we first got word of you from the Goddess. Mercury is technically the planet associated with your sign, though it does not account for the raw intensity of Virgo, nor your potential to be single-minded to the point of obsession. 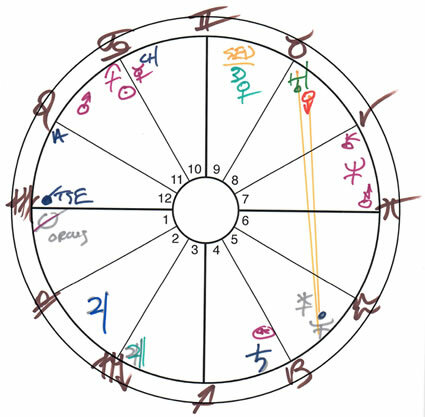 Hand-drawn chart of your INVOLUTION reading for Virgo. Chiron helps us with that; and at the moment, this planet of healing, awareness and growth is in rare form. There's about to be an alignment of Mars, Saturn, Chiron and a newer centaur planet called Pholus, and this seems designed to take you to a new level of consciousness. There's one particular psychic quality up for review: whatever need you may have for others to push you into the things you want. This works, in a sense; though to the extent you depend upon it (if at all) the thing you're depriving yourself of is experiencing your own actual volition. That's the thing you need -- it's what stands between you and your concept of yourself as a whole and independent person. The essence of Virgo vibrates with intention, purpose and connection to the deeper truth. Now you need to thunder with the pleasure of choosing. An honest view of the world reveals that, in our time of history, the stripping away of the power of choice, and the beauty of choice, is a theme of our lifetimes. This has left people feeling frustrated and, in essence, victims of their own power -- or their inability to take up their power. This summer's total solar eclipse happens in the last inches of Leo, right before your sign begins. It's a cusp event. This is, even now, presenting you with a passionate need to get underneath your own resistance and your seeming motives, and to see out to the horizon and for many miles in many directions. I'll have more in your INVOLUTION reading for Virgo. You may pre-order here, or get all 12 signs here. The reading will be available shortly.